Universal mobile telecommunication system (UMTS) networks based on wideband code division multiple access (WCDMA) have been deployed worldwide as 3rd generation mobile communications systems. UMTS provides a clear evolutionary path to high-speed packet access (HSPA). HSPA refers to the combination of high-speed downlink packet access (HSDPA) and high-speed uplink packet access (HSUPA). HSDPA allows data rates up to 14.4 Mbit/s in the downlink. HSUPA makes uplink data rates of 5.76 Mbit/s possible. HSPA also boosts capacity in UMTS networks and provides significant latency reductions. In order to exploit the full potential of WCDMA 5 MHz operation, the performance of HSPA-based radio networks has been further enhanced in terms of spectrum efficiency, peak data rate and latency. HSPA+ as specified in 3GPP Release 7 includes downlink MIMO operation, higher-order modulation (downlink 64QAM, uplink 16QAM) and protocol improvements that specifically allow a high number of “always on” users to be supported in the network. Peak data rates reach 28 Mbit/s in the downlink and 11.5 Mbit/s in the uplink with round-trip times below 50 ms.
3GPP Release 8 specifies further improvements for HSPA+ such as downlink dual carrier operation and the combination of MIMO and 64QAM modulation. Both features enable a maximum data rate of 42.2 Mbit/s in the downlink. Furthermore, circuit-switched voice over HSPA provides optimized support of voice services in an HSPA packet-switched radio access network. In addition, latency is further improved by allocating common E-DCH resources in the CELL_FACH state and applying Layer 2 enhancements in the uplink. 3GPP Release 9 continues to improve primarily data rate capabilities. The dual cell HSUPA feature supports two carrier frequencies in the uplink direction leading to uplink data rates of 23 Mbit/s. Additionally, in downlink direction dual carrier operation can be combined with the MIMO feature reaching data rates up to 84.4 Mbit/s. Spectrum flexibility has also been increased because the dual band dual cell HSDPA feature makes it possible to allocate resources on two carrier frequencies in different frequency bands. The latest 3GPP Release 10 specification includes four carrier HSDPA, which enables to pool four carrier frequencies for a single end user device and thus span 20 MHz bandwidth. UMTS WCDMA/HSPA/HSPA+ is being specified in the 3rd Generation Partnership Project (3GPP). 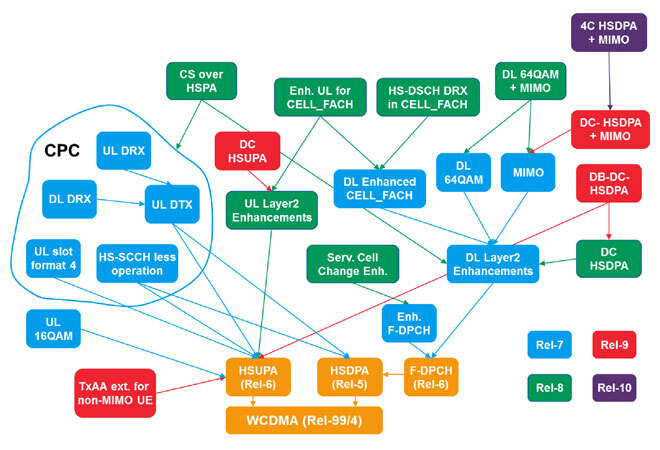 3GPP Release 99 contains the first WCDMA specifications. HSDPA and HSUPA were introduced in 3GPP Release 5 and 3GPP Release 6, respectively. HSPA+ forms part of 3GPP Releases 7, 8, 9 and 10. The advantage of HSPA and HSPA+ is their excellent integration into the UMTS architecture. HSPA and HSPA+ also operate on the existing UMTS frequency bands. All UMTS networks worldwide support HSDPA. HSPA and HSPA+ will benefit all applications in which large volumes of data are transmitted in both link directions. Moreover, UMTS provides highly efficient support for CS voice services. Rohde & Schwarz provides a complete product portfolio for WCDMA/HSPA/HSPA+: digital standards on general-purpose equipment such as vector signal generators and signal and spectrum analyzers; communications testers and complete conformance test systems. Powerful network scanners in combination with drive test software completes the Rohde & Schwarz test and measurement portfolio for WCDMA/HSPA/HSPA+. Future implementations will reflect the most recent 3GPP enhancements.